Light Up Your Life...Some Lighting Basics, And Where To Get Great Deals On Lighting For Your Bedroom, Or Your Entire Home! Before we give you our platinum list of lighting retailers below, here are some lighting basics. There are three types of lighting: ambient, task and accent lighting. Ambient, or general, light illuminates the entire room, essentially flooding it with light.. This basic form of lighting replaces sunlight and is fundamental to a lighting scheme. It needs to appear as natural as possible, and should be pleasing, day or night. Task lighting provides illumination for specific tasks, such as cooking or reading. Not as much a pinpoint beam of light, but rather narrowed in focus. Task lighting should be free of distracting glare and shadows and should be bright enough to prevent eyestrain. Accent lighting highlights specific features of a room, such as cabinets, ceiling beams or artwork. It can create visual interest in a room by highlighting certain architectural elements, such as a mantel or the texture of a wall, or a piece of art. All three types of light can work together to fulfill the lighting needs of a room. Let's take the dining room, for example. The most obvious purpose of the dining room is to eat, right? But the table also may serve as a desk space for your children to do their homework. And if you entertain, you'll want to set the lighting mood differently. A traditional chandelier usually works best for general light with recessed downlights providing more targeted light for specific tasks, such as homework. Wall sconces or wall washers can provide a subtler feel. Another option is to set any or all of the fixtures in a room on a dimmer switch so that you can easily control the amount of light in the room. Once you've considered what types of activities will be taking place in a room and what type of lighting is needed, you can decide what fixture will best fit your needs. Walking into any home improvement store lately, you've surely seen the plethora of lighting fixtures available. Before making any decisions about your fixtures, make sure you ask your builder if there are any restrictions on the types of fixtures that can be used in any specific room. Sometimes things such as ductwork, insulation or ceiling height can affect whether or not a fixture can be installed properly in a room. Ambient such as recessed downlights, cove lighting, soffit lighting, valance lighting, wall washers, sconces, surface-mounted lights, pendant lights, track lights, chandeliers, under-cabinet lights and portable fixtures. Task such as valance lighting, pendant lights, under-cabinet lights and portable fixtures. Accent such as all washers, sconces, track lights and under-cabinet lights. Certain fixtures are designed for a specific type of bulb, such as a two- or four-pin fluorescent bulb. Others can accommodate the more common screw-in type. When choosing fixtures, be sure to note what type of bulb it requires, so that you won't be surprised to find the bulb you bought isn't the right one. One thing that we know from years of being in the bedding and home furnishings business is that stores make HUGE profits on lighting. It's one of the most lucrative categories in home furnishings because customers have NO IDEA how crazy the markup is with lighting products. Don't waste your time wading through endless web sites if you are looking for the perfect floor or desk lamp, or even a really cool ceiling fixture or chandelier. Here's our list of dealers and web sites that carry a broad range of products, and at exceptional prices, hand picked by our team of home furnishings industry CEO's! Lighting Etc. is an online store we really like. Their selection is very broad, and includes everything from Tiffany lamps to really cool industrial style lighting. You can find the perfect table or floor lamp, ceiling fixture, or accent lighting piece. And, they even have a great selection of bedroom furnishings. An online store which is more geeky and fun, largely driven by LED technology, LightingEver.Com carries a huge array of desk and floor lamps, LED strip lighting in the even you wanted to create an underglow effect for your new bed, and is chock full of information and endless possibilities. Our CEO's have bought many fun little lighting doo-dads from this store. Check it out! Okay, it's just too cool to pass up. 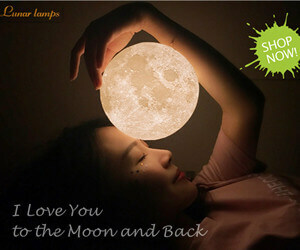 Lunar Lamps offers a very unique desk or table lamp, which is designed after NASA map imaging of both the texture of the lunar surface and radar imaging of the surface. For $30, you need to have one of these in your bedroom, somewhere. Worth checking it out.